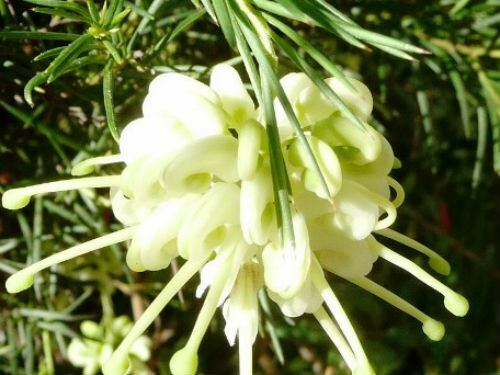 Grevillea rosmarinifolia ‘Lutea’ is a small shrub that is said to reach a height of 40 cm with a spread of 50 cm. In our cold climate garden 10 yr old specimens are one metre tall with a 50 cm spread. The leaves are light green, two cm long, linear with a sharp point. Flowers are cream with a waxy texture and held in large, conspicuous clusters. The lengthy flowering period extends from winter to late spring. Light pruning after flowering is appreciated. Honeyeaters, especially Eastern Spinebills, are frequent visitors to the blooms in our garden. This variety was selected from a variable population near Daylesford, Victoria many years ago. We first came across this cultivar in an Armidale native garden many years ago. We were attracted to the large flowers. Cuttings were freely given by the owner. Since then we have propagated many specimens and plants appear in many of our shrubberies. This is an under-rated Grevillea. In our cold climate garden plants have proved to be hardy and free flowering. This cultivar must be propagated from cuttings to preserve its desirable characteristics. This is not a problem because cuttings take root readily. The cultivar is also known as Grevillea ‘Lutea’.